How to add a biometric time and attendance device to Clockit? 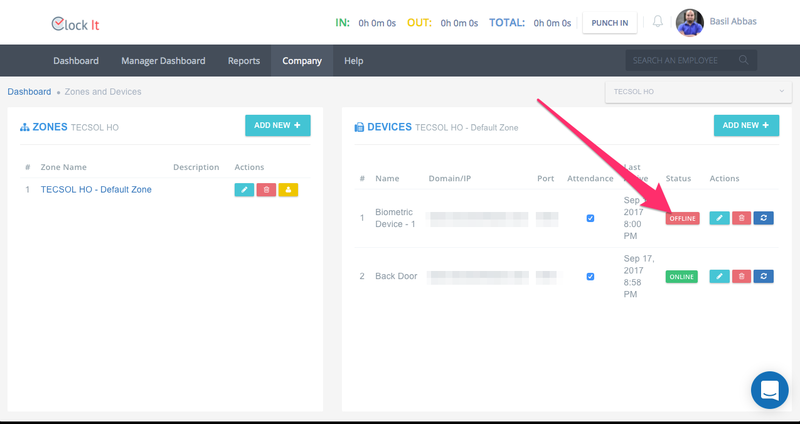 Find detailed instructions on how to add your biometric time and attendance devices to ClockIt and how to configure them. ClockIt allows you to connect your biometric time and attendance device and pull data directly to our servers for processing. You add many devices to ClockIt at the same time such that users can punch into any one of the added devices. Each site can have multiple zones and each zone can have multiple devices. To understand this better a site can be HQ and Warehouse. A Zone can be First Floor and Second Floor and the device can be Front Entrance and Back Entrance. To add a zone click on the add new button. Ensure that you have the correct site selected. Enter your Zone name and give it a short description for reference. 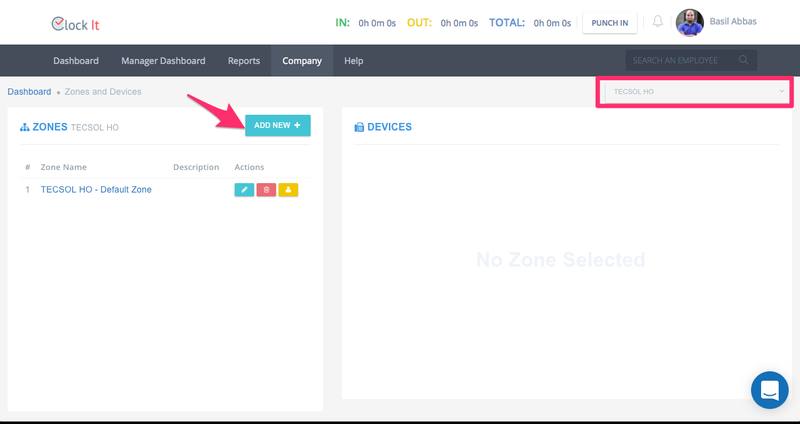 Next, select the zone created and click on Add New to add your device. Next, fill in the details about your device and hit test connection. If successful you will see the detailed response from your device. Please be patient as this can take a few minutes. Once done you can save the settings. Once your device is added, ClockIt will poll the device every 30 minutes and save the data to the user that it is attached to. To know the status of your device and the connection logs, you can click here. To know more about the connection parameters and port forwarding, follow the next section. ClockIt supports over 900 devices, if your device has the ZKTECO brand or any supported ZKTECO board it will be supported by ClockIt. All your existing data from the device will be saved into ClockIt once you successfully connect the device. For ClockIt to read data from your biometric device, you will need to configure your internet router and your biometric fingerprint time and attendance device. There are two parts to this configuration. Configuring your biometric time and attendance device. Access the setting on your biometric device. You might need admin privileges if you have locked your device. Admin privileges can be as simple as your fingerprint, PIN, RFID or even facial recognition. Go to the network settings on your device. Setup the static IP for your device along with the subnet mask and default gateway. NOTE: Getting this wrong will prevent the device from responding to ClockIt. Ping your device from your local network to ensure that everything is working as planned. Go to port forwarding settings in your router. Forward any available external port to 4370 and the internal IP of your biometric device. In the above example, I am forwarding external port number 4500 to 4370 and my biometric device IP is 192.168.1.200. Assuming that my public IP is 106.23.23.25, I should be able to access my biometric device from 106.23.23.25:4500. You have to use these settings in ClockIt under manage device. If your router required you to specify the source use portal.clockit.io or 52.77.76.145. 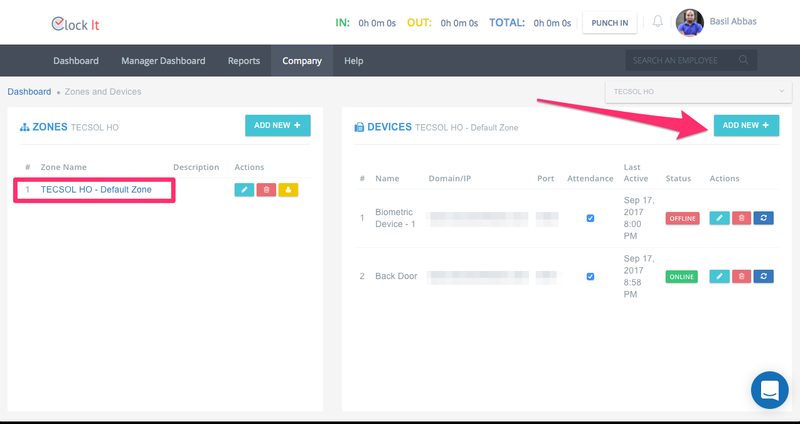 Save your setting and use a port scanning tool to find out if the port forwarding is setup correctly. You can use the port forward utility included in network utilities in OS X. If you are behind multiple routers, forward the port from one router to the other until the device is finally reached. Since you have a dynamic IP, your IP will change every time your router is restarted or our ISP changes it. There needs a to be a way of saving your IP somewhere to let ClockIt know that your IP has been changed. The way to do this is with dyn.com. 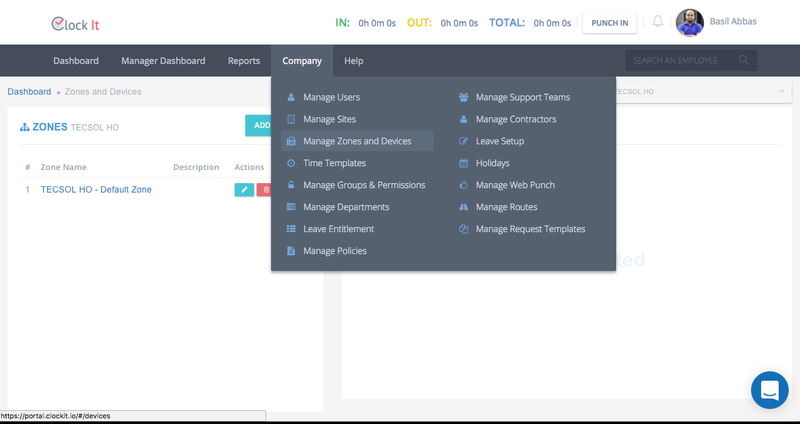 Create a Dyn account and proceed to the next step. Once you have an account, you will need to specify a host. For Example, I can create a host like clockit.dyndns.org. Goto DDNS settings in your router and enter the host, username, and password of your Dyn Host. Your router will keep Dyn informed about your IP change and will be saved under clockit.dyndns.org. Follow this guide to configure your firewall if any.